Richard Alexander Fullerton Penrose was born in Carlisle, Pennsylvania, on March 24, 1827, the second son of Charles and Valeria Fullerton Biddle Penrose. He attended Dickinson College, graduating in 1846, and later, in 1872, received an honorary Doctorate of Laws from the same institution. He immediately entered the Medical Department of the University of Pennsylvania, receiving his M.D. in 1849. After graduation, Penrose served as a resident physician at the Pennsylvania Hospital for three years. In 1854, he successfully opened the wards of the Philadelphia Hospital (later Philadelphia General Hospital) to medical instruction, and became a consulting surgeon at that institution. In 1856, he was one the founders of the Children’s Hospital of Philadelphia. 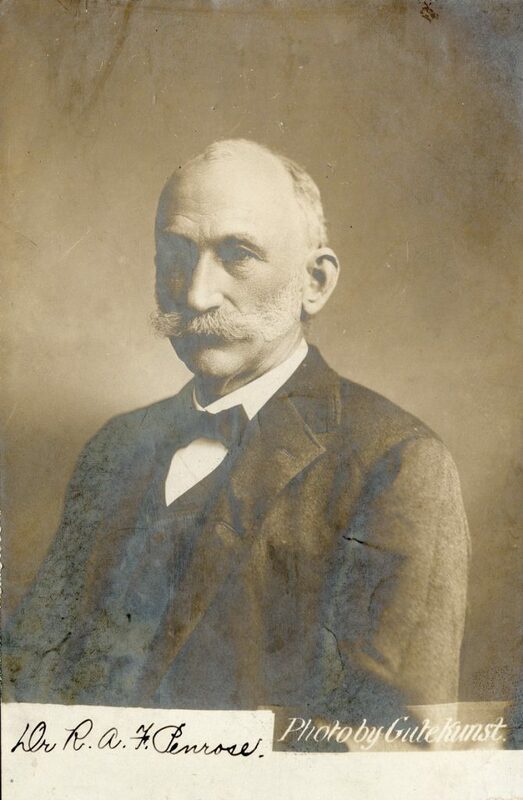 In 1863, Penrose replaced Dr. Hugh L. Hodge as professor of obstetrics and the diseases of women and children at the University of Pennsylvania, a chair which he held until his retirement from teaching and practice in 1888. He also continued to teach this specialty privately as well as in the University’s medical school. During the Civil War, Penrose was an acting assistant surgeon in the Union Army, serving as a doctor at Satterlee Army Hospital in West Philadelphia. During his career, Penrose was member of the American Philosophical Society and the Philadelphia Academy of Natural Sciences. He married Sarah Hannah Boies of Wilmington, Delaware, in 1858; they had seven sons. Penrose died in Philadelphia on December 26, 1908.